Ligament injuries are the most frequently ignored and misunderstood factor in low-back pain. More often than not, chronic pain in the low-back area is caused by tears and subsequent adhesive scar tissue formation in the ligaments. 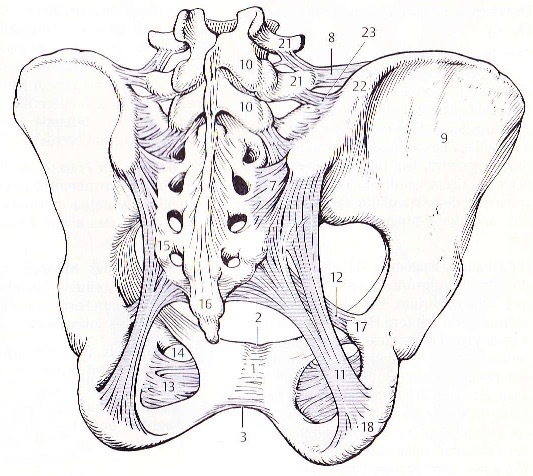 Although the majority of low-back pain actually originates in the sacral ligaments, tears to the ligaments at L1 through L5 and the iliolumbar ligament occur frequently and can be very painful. Pain in the low back may be accompanied by referred pain felt in the buttock, groin, genital, thigh, lower leg, foot, or a combination of these areas. 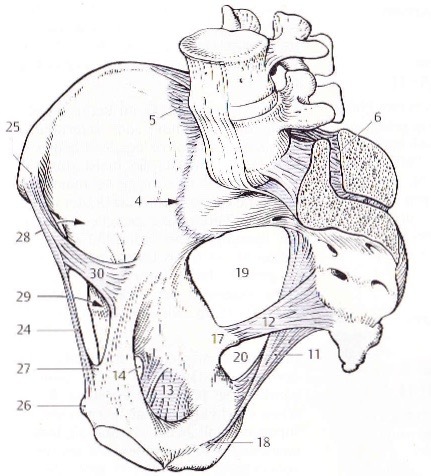 The ligaments most frequently sprained include the supraspinous and interspinous ligaments between L4 and L5 and between L5 and S1, as well as the iliolumbar ligament. Depending on the location of the tears, a client may experience pain on either one or both sides of the low back or directly in the center of the low back. Pain does not refer across the midline. If a ligament is injured on just one side of the back, pain will be felt on that side only. For example, an injury to the iliolumbar ligament on the right side will not cause symptoms on the left side of the body; any referred pain will be felt in the right buttock, groin, or thigh. An injury to the right or left edge of a supraspinous ligament will cause pain on the right or left side of the back, respectively. An injury directly in the middle of a supraspinous ligament will cause pain felt right on the spine. If pain is felt on both the right and left sides of the low back or experienced as a band across the entire low back region, this generally means that ligament segments on both sides of the spine are injured. In addition to indicating which side of the body has been injured, patterns of pain referral can also help us determine how serious the injury is. The distance a pain is referred from its source is directly proportional to the severity of the injury. If a low-back ligament injury is not too severe, the pain may not refer very far into the buttock and thigh. When an injury is moderately severe, the pain will generally refer into the thigh and lower leg. With very severe injuries, the pain is more likely to be referred all the way to the foot. Low-back pain may appear suddenly, either as a result of a traumatic event or with no apparent cause. Sudden pain may come on after a fall (even a minor one) or after lifting a heavy object. If someone sprains a ligament during a sports activity, when that area of the body is warmed up, the person may feel nothing at all until the area cools down hours later. Low-back pain often begins after a car accident. If the accident is severe, the pain may be felt immediately, but often it does not begin until several weeks later. This is likely due to the time it takes for pain-causing adhesive scar tissue to form. Low-back pain may also come on slowly and imperceptibly, beginning with a slight ache in the low back after tennis or gardening or just sitting for an hour or two. This ache then intensifies gradually over several weeks or months, until the person is incapacitated for increasing periods of time. The pain may persist or come and go with different kinds of activities. Often, prolonged sitting causes the back to ache, and lifting a heavy object will start a new bout of pain. A ligament will tear if it becomes fatigued or if more work is demanded of it than it is capable of performing. A precondition for injury can be created by poor alignment, which puts constant stress on the body; excess muscle tension, which diminishes blood circulation; poor diet, which depletes the body of its resources; poor exercise habits, such as not warming up properly prior to exercise; or inadequate physical activity, which causes muscle weakness. When back pain keeps recurring, this is frequently because the ligaments have healed with weakened, poorly formed adhesive scar tissue, which easily tears again under stress. The discs are normally in their most spongy, flexible state when we arise in the morning. As we stand and move about, the weight of the body exerts a compressing force, transmitted through the vertebrae, on the discs. Due to this compression, small amounts of water diffuse through the disc membranes into the vertebral bodies throughout the day. By the end of the day the discs have slightly narrowed, and we are a little bit shorter than we were in the morning. When we go to sleep, the water that was absorbed into the vertebral bodies slowly diffuses back into the discs, and the discs are restored to their original size. In some people, the discs are abnormally compressed due to excessive tension in the erector spinae muscles. If a person is chronically tense, these muscles can exert a compressive force on the vertebrae, and in turn on the discs, that far exceeds the natural forces of gravity. Over time, in a very tense person, an abnormal narrowing of the discs may result. This narrowing has a harmful effect on the spinal ligaments. 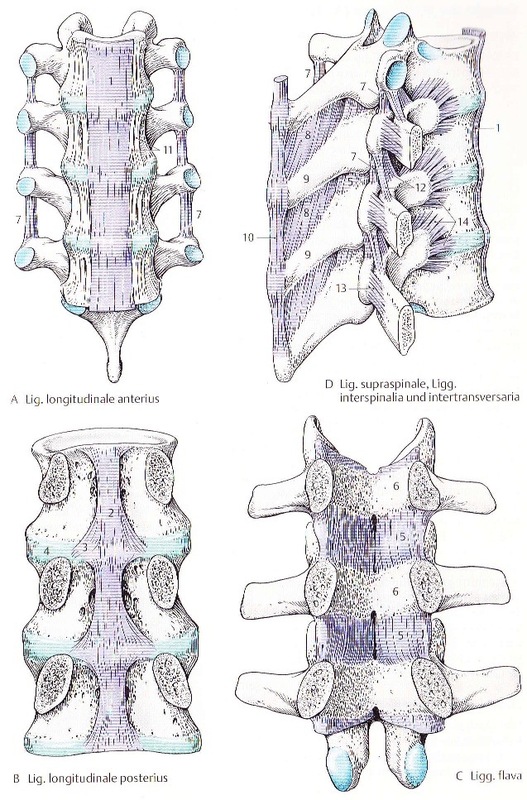 Spinal ligaments are designed to be held taut by the height of the discs. This keeps the ligaments working, maintaining their structural integrity in the same way that muscles or bones maintain their strength through use. When muscle tension causes discs to narrow, the ligaments slowly lose their strength because they are not being fully utilised. Deep massage applied to the low-back region often helps to reduce muscle tension, increase circulation, and speed the healing process. Massage therapy is most helpful when paired with transverse friction, which breaks apart pain-producing scar tissue. While the iliolumbar and sacroiliac ligaments are more or less easy accessible, it is very challenging and in some cases impossible to massage the interspinous and supraspinous ligaments. In those cases other techniques are required. The frictioning massage is applied across the fibres with gentle pressure at the beginning slowly increasing as the tenderness allows.